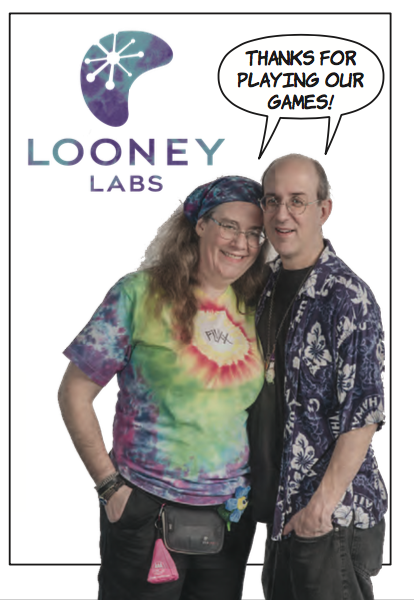 There isn't any kind of official thing you need to sign up for to be a member of the Looney Labs Fan Club - all you need to do is jabber enthusiastically whenever the subject of our games comes up. Pretty simple, really. Thank you for being a fan of Looney Labs Games! and did you know that Andy has a BLOG and a PODCAST too? We don't have an organized demo program, but we do keep an internal database of fans/friends who are interested in hearing from us about any playtesting and/or demo opportunities that may become available when the Looneys are traveling nearby where they live. You can add youself to this database by taking our Looney Labs Volunteer Survey. Over the years we have had various official fan club and demo team groups, all of which are no longer active. We had active mailing lists (archived here) back in the late 90's through 2009, and a NING forum from 2010 through 2017 (archived here). Andy's old Wunderland blog (archived here) is another great place to explore old content from Looney Labs. Thanks for your interest in Our Games and Our History!